I would welcome your feedback whenever you have a chance to get to it...no rush. I like the look of the wood to the left of Robbie, but was perplexed why the wood on the henhouse looked so different until I realized that I was inadvertently smudging it for weeks. The paper that I was using between my hand and the drawing to protect it was in fact moving and causing friction, so I was repeatedly blending all my hard work! Good learning that I need to tape my hand guard down in the future. You should be absolutely delighted with this, Kara. Despite your smudging problems, which I fully understand. Personally, I use a strip of the same paper I'm drawing on for a handguard, and I fix it at its bottom end with two clips, so it cannot move or rotate. But I can still peel it back to see underneath if I need too. And, because it's the same paper type, I can use it for practicing any crucial lines before I commit them to the drawing. Given the smudging you mentioned, you've managed to save that area very well. I'll start at the back and work forwards. But first, I must commend you on your wide choice of values. The strength of your darks has added a lot of depth to a composition that didn't possess much. The interior of the old henhouse recedes really well, and the space beneath it is both dark and solid, but I'll return to that later. Robbie the dog looks delightfully hairy, and with a good texture. 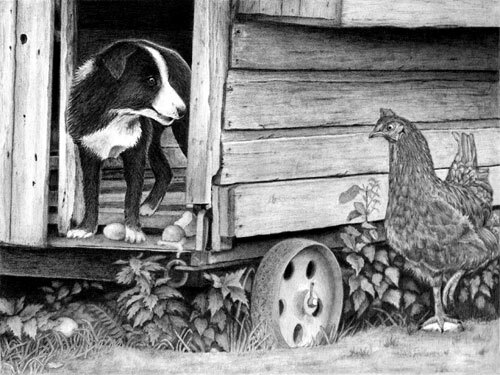 I really believe you were living within the scene as you drew it because you've noticed things that many people miss - such as his back paw being in the shade of the henhouse and Robbie's own shadow. It might surprise you to learn how many people draw his rear paw as light as his front paws. 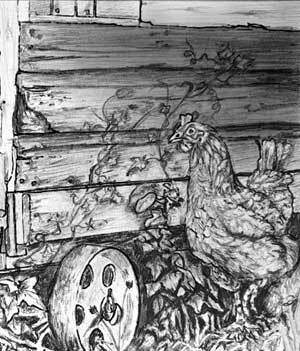 This is a composite study - neither Robbie nor Henrietta ever saw this henhouse, which I burnt many years ago - and the key to succeeding with such compositions is to always be aware that you have to connect the elements and make them live together harmoniously. His eye has a bright highlight that immediately attracts me to him. He has very solid and logical form. I can see your understanding of his form as you established the shadows and highlights - all very logical and natural in appearance. In the same vein, the reflected light along his back serves excellently to separate him from the dark wall behind. As it also does in dividing Robbie's front leg and shoulder from his rear legs that are in deep shade. As for his egg "toys"... they're very believable, and contrast so well with the softness of his hair. They're smooth and semi-reflective; the broken shell of the right-hand one has an obvious thickness; and I really like the way the egg-white is running over the edge. I believe it's when you're "lost" in a drawing that such features occur to you, so I'm particularly pleased to see that happen. My goal was to make Henrietta look realistic but she still looks a bit cartoonish to me. Is it the oversized white of her eye? I thought about minimizing the highlight a bit more, but was terrified it would destroy her eye and I'd never be able to return the highlight to pure white, despite Blu-Tack. I too feel Henrietta is slightly unnatural. And I agree that it's the highlight in her eye that is the root of the problem. She does need a bright highlight to attract the viewer's attention to her, but that's a highlight on steroids! I also think you're correct in not trying to alter it. It's a relatively simple task in Photoshop. The highlight I've created is probably all she needs, and it does appear to have removed the "cartoon" look. 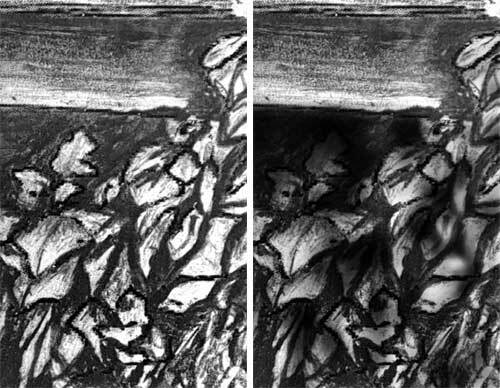 Whatever you try, it's unlikely to restore the pristine white of your paper. I succeeded once in a remarque, by using a scalpel to remove the graphite, but that was on coated card, so I only had to dig through the coating. Your understanding of Henrietta is masterful. She has a wonderful feeling of solid form and, in my opinion, just the right suggestion of feathering. She's obviously feathered but in a way that doesn't distract. 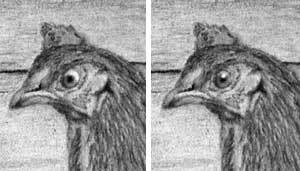 Her down-turned mouth transmits her sense of outrage about what she fears is happening to her precious eggs. My only reservation is that brighter highlights in her raised left foot would have added to the story. She might be running or has paused - we don't know - but it's the only implied movement in the composition. Coupled to that is the rock she's standing on, which attracts attention away from her. The drawing of the wood, with its subtle texture and suggestions of decay, is very believable. As our the nail heads that are present but not intrusive. It's so easy to over-detail a secondary element such as wood and its features, so you did well to avoid that. The nest box is obviously protruding, and you've made good use of its shadow, and engineered the values of the wood, to award Henrietta the prominence she requires. I find myself asking myself so many more "Mike's how-do-you-know questions" while drawing :) . Such as, how do you know it's... round, receding, forward, turning, soft, rough, metal, light, dark, etc. Such a simple tactic, but I think it's positively impacting my work, and I feel I've learned so much in a very short time. That thinking is so clearly evident in your foliage. Your weeds possess excellent depth, especially at the left hand side. 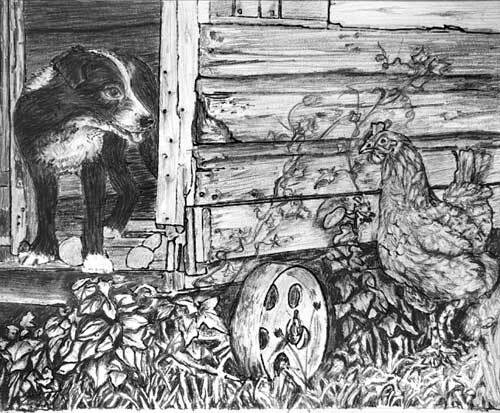 The deep shade you established beneath the henhouse gave you the opportunity push some of the weeds far back into it, which created instant depth. There's a definite sharp-edged foreground too, and a midground that nicely connects the two. That weed to the left of the wheel, for instance, is clearly growing from under the henhouse and bending forwards into the light. I think a drawing really succeeds if there's something fresh to look at on a second or third visit. The more I look at your weeds the more I discover. For example, even though the fallen egg is clearly visible once it's been found, you did a good job of hiding it in the weeds. It often pays dividends to allow the viewer to find some elements later. Finally, the foreground: often less is more in a foreground situation, which is why I personally leave that area until last. That allows me to use it to balance the whole and draw the eye in to the composition. There's nothing wrong with your foreground, even though it's rather empty, but there is one suggestion I'd like to offer. To the left of the wheel, either extend parts of the weeds lower, or introduce a couple of extra clumps of grass - similar to those beneath Henrietta. That would break up the rather unnatural, almost mechanical, arc that sweeps between Henrietta and the fallen egg. Even just softening that edge in selected places would help, as you did to the right of the wheel. I've really enjoyed working with you, Kara, and this is an excellent result. just to show I'm still working on this, but need some help with doing black hair and making the dark stand out from the dark please. It's progressing well, and there's a lot of good work in it. There are, however, a few areas that can be improved, and one common error. I'll begin in the top left, where that error is, and work towards the bottom. Your darks could be darker or, more accurately, darker and more solid. 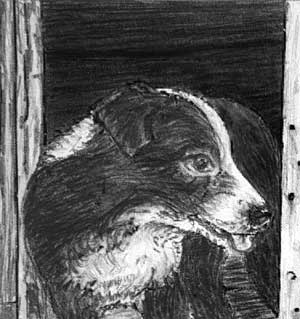 I think you've kept the interior of the henhouse relatively light in an attempt to make Robbie, the black dog, stand out from it. But the reverse would be a better choice. 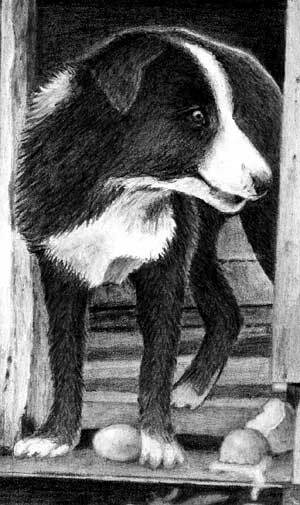 A very dark interior would have a different appearance from the dark dog, because it's non-reflective. Conversely, Robbie has a glossy coat, so you can use highlights to bring him forwards. That's particularly true of his back, where you could subtly use reflected light to create a definite division between him and the background. Robbie's rear would be in the shade too, so it wouldn't contain any light values. Darken the interior and Robbie's rear, and then use a little reflected light along his back to create that edge (as shown below). That pushes his rear back and his head forwards. Robbie's hair generally follows the direction of growth - but that's as far as it goes. If you look closely at the reference, and ask questions of it, you'll see that we understand Robbie's three-dimensional form because of the highlights on his coat. Consequently, it needs careful drawing to recreate those highlights. You also need to consider his position in the scene. His rear, as I mentioned, is inside the henhouse where there is little light. His front is in full sunlight. That means, for example, that his rear paw will be in semi-darkness, and his front paws will be brightly lit. 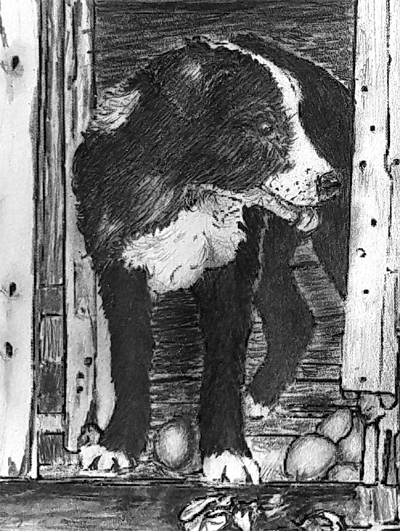 This is a composite scene - Robbie never saw this henhouse - so you have to work to tie all the elements together. Finally, Robbie's eye is almost a classic example of drawing what you think you know rather than drawing what you see. He has everyone's idea of what an eye looks like - it's their stored "eye recognition" image as seen directly - not at an angle - and it's human. That means, from Robbie's viewpoint, his eye is looking sideways and not forwards. The wood on the side of the henhouse is full of character! The more I look at it, the more interest I find - yet it's not dominant, which is perfectly pitched. There is, however, something missing - and that something will make Henrietta the hen spring forwards... the cast shadow. You can see from the references that the nestbox in the top right-hand corner protrudes from the wall. It will cast a shadow, and I think you can be quite inventive with it. Here, I've extended it down far enough to allow highlights in the hen's head to shine. That alone will help to make her dominant. As for Henrietta herself, I think she has a lovely sense of being feathered without the feathers being a distraction. She's a little flat at present, and could do with more three-dimensional shaping, such as shade beneath her chest. I'll skip the eggs and wheel, because I think you're still working on them, and move on to the foliage. The left-hand end is one area that would definitely improve with solid darks. Any light patches you leave in the shade beneath the floor will be seen as being "foliage" in the shade. But you need solid areas too for that to work. The solid black areas tell us this is the extreme background and everything is in front of it. Also. with that black established you now have far more values available for the foliage in that area. You can push some leaves so far back that they're almost lost to sight, but they'll add both depth and realism. Then work forwards towards the light. That way, every layer will already be surrounded by its "background" that you can refer and react to. Try to not use white in leaves. They don't naturally contain it. Instead, save it for your main highlights - such as a drop of water, or the key highlights in Robbie's and Henrietta's eyes. If they are the only white in the drawing, they will shine like beacons and attract the viewer directly to them. The same applies to the foreground grass. Establish a few black areas in it, to fix the absolute background, and then create depth as you work forwards towards the lighter foreground blades. As I said earlier, there's some lovely work in this. It just needs a little more work in some areas. This is about my 4th attempt! Thought I'd get some direction before starting number 5! Not happy with the lines, but not sure how to make it a tad lighter without having spaces, and too much short line rows would look just as bad in a different way. Are you referring to Robbie's hair? You've made a huge improvement! He's definitely hairy now; his hair is growing in the correct direction; and his eye is much better. Previously his eye was looking out of the side of his head. Consider that, at that angle, you would not see a completely round iris. Instead, you'd be looking almost sideways at the eye, which makes a very narrow ellipse of the iris, and the cornea would be bulging forwards - that is, with an obvious curve facing his nose. I don't think your alteration is completely correct, but it's very close to correct, and doesn't "look" wrong. And the eye is now looking in the same direction as his nose, which adds a lot of realism. As far as I can see, you made two other major changes - the foliage, and the foreground grass. You've darkened the area beneath the henhouse, which has greatly improved its depth. You could improve it even more by making that shading solid - particularly along its top edge. Any lighter patches lower down would probably be seen as being very dark elements in the deep shade. You've also pushed a few leaves back into the shade, and one leaf at least now transitions from shade to bright sunlight. That neatly joins the two planes. The problem that remains is the lack of midtones. Your values are either very dark, or black, or very light. Leaves aren't white. Try lightly toning down a foreground leaf. That will give you a range of values to work with - from a black background to a light grey foreground. And don't forget about cast shadows. you have established a few, but they're not consistent - which they must be, given that there's only a single light source. The same problem exists in your grass. There are large black "holes" between blades - so large that we naturally expect to see something in there. That's easily corrected by cutting a few random lines through them with a kneaded eraser or Blu-Tack. Then tone those down to push them into the shade. At present your grass is either foreground or black hole. There's no midground. Just a couple of final bits of advice: the broken eggshell to Robbie's right relies heavily on dark outline along the broken edge. Use a thin white line instead, which represents the thickness of the shell. And don't forget to add shading beneath the overhanging nestbox. 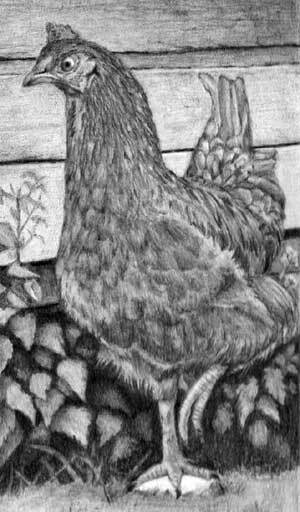 That will give you a darker wall behind Henrietta's head and improve the visibility of any highlights you leave in her. That alone will improve her dominance in the drawing.